Even though today is regrettably Thursday, tomorrow I have my budget post scheduled to go up, so I'm going to talk about the weekend today. Sunday is my little sister's birthday, and with our eight year age gap, her birthdays certainly do make me feel old. Last year we lived it up for her 21st, by which I mean, did frosting shots at Sweet, got mannis, and indecisively walked from one bar we didn't like to the next on a bitter cold night in Boston. I may have also squeezed a nap somewhere in between there because an appropriate time to leave the house when you are 21 is 11:30, which to me on most nights is bedtime. This year I'm opting out of the evening celebrations, but dinner and cake with the family will undoubtedly be pretty great on it's own. With my own 30th birthday looming, it's hard not to think about this being the end of my youth, though if you asked me if I'd like to go back to 22 and do it all over again, I'm not sure I'd want to. Even at 22, I never left the house at 11:30 pm - if I was still home by then, guaranteed I was asleep or very nearly! But goodness, I can't imagine having a sibling eight years younger and reliving those 22-year-old experiences at their birthdays. My brother and I are three years apart and that gap, with our very different ideas about how to have fun, is enough that going out with him once or twice a year is exhausting. But happy birthday to your sister, I'm sure she'll have exactly the kind of fun that will seem exhausting to her in just a few short years ;) And as for this outfit, I think I'm recreating it this weekend, because I have all of the necessary pieces and it's so ingeniously simple, I'm really wondering why I've never thought of it! what a lovely cozy look! My view on age-appropriate behavior is always skewed from real life because I was a mom so young, but I can say with certainty that I am WAY too old for that stuff now (even though I'm only just turned 34) and I am also completely ok with leaving my 20's behind. But happy birthday to your sister! I love the relaxed weekend vibe of your outfit! That sweater looks so cozy. Turning 30 seemed such a huge milestone for me, but I really think things are getting so much better the older I get! 30.."end of youth..." ??!! Seriously, please leave flowers in my grave. Love your distressed denim, cardi, and hat! Have fun celebrating your sister this weekend. I'm loving your grey cardigan! Have fun with the birthday celebrations this weekend! 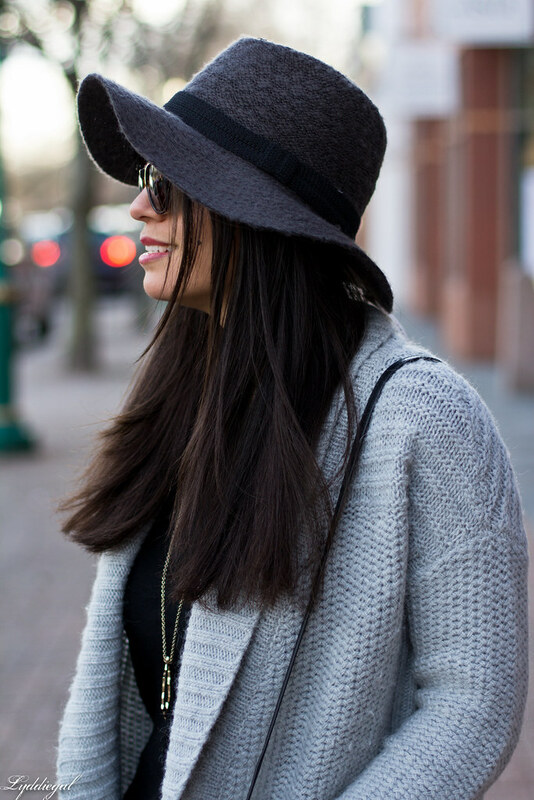 I love how you paired your cardigan with a hat! cute look! Sounds like a fun weekend to me, happy birthday to your sis! (I understand skipping the night activities--11:30 is WAY past bedtime for me, ha!) 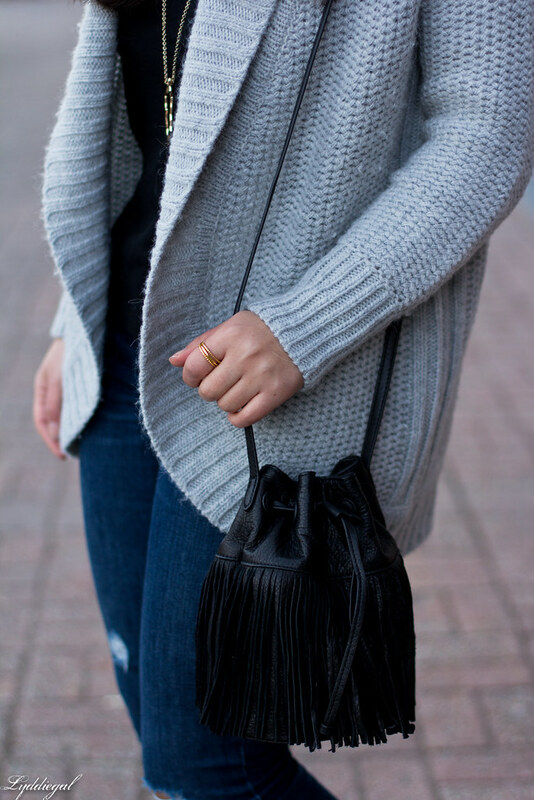 I love this look, that sweater looks perfectly cozy, and I love your fun fringe bag too! Perfect accessories! I love the hat and your fringe bag! Have a fun weekend! Love your necklace. Perfect outfit. Amazing and really inspired! It will help me in a selection a special gift for very special to me. Also have some special fashion & Health gifts for you with this subscription. Great look and hope you had fun celebrating your sister's birthday!